The second ruler of Sri Lanka was King Panduvasudeva, the nephew of Vijaya. Panduvasudeva married Baddha-Kacchayana, a princess from India. The couple had ten sons, the eldest of whom was named Abhaya, and one daughter named Chitra. 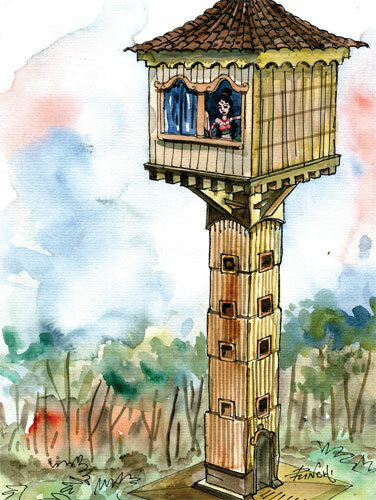 was imprisoned in a secured small house on top of a tower which was called "Ektam geya" in Sinhala by the King. She was looked after very well by the maids. The brothers of Queen Baddakachchana too came down to Sri Lanka and formed villages. Deeghagamini, the son of one of the those brothers, Digayu, was entrusted with the services of the palace. Prince Deeghagamini fell in love with Princess Unmadachitra who was his first cousin and started to visit her surreptitiously. The two servants, Chitta and Kalavela who were very fond of the queen, helped the prince. Unmadachitra became pregnant by Deeghagamini. Chitra married prince Deeghagamini and had a son, who was named Pandukabhaya. When this secret was laid bare Kalavela and Chitta were beheaded. The worship of the dead was being practised in our country during the pre-Buddhist era. There was a belief that the dead are reborn as ghosts or spirits. That might have been the reason why the people must have believed that Kalavela and Chitta must have been reborn as a ghost and had an influence on the life in the womb of Unmadachitra. The intention of the uncles was to kill the newborn child provided that it was a male. Chitra and Dighagamini had been made aware of the prophesy at the time of their marriage and had promised to put to death any son that Chitra gave birth to. However, once Pandukabhaya was born, Chitra was unwilling to kill the infant, and so she exchanged the baby with another woman who had given birth to a baby girl that same day. Unmadachitra arranged to get down a female child born to a woman on the same day, and send her son to that woman through a servant. While the maid servant was carrying the prince Pandukabhaya in a basket to Doramadalawa, she met the uncles of the prince who were on a hunting spree. She was ordered to keep the basket down. At this moment Kalavela and Chitra who had been slain and were reborn as ghosts were present in the form of pigs. Since the attention of the princess was diverted towards the pigs, it was possible for the servant to take the baby prince to Doramadalawa free of trouble. Chitra's brothers were not satisfied that their sister had, indeed, given birth to a girl. As a result, several attempts were made to kill Pandukabhaya, which resulted in many children dying. Pandukabhaya remained unharmed. Even after that the uncles of the prince had sought to kill the prince several times but it had been a futile effort. Prince Pandukabhaya received his education from the Pandula brahmana. This brahmana knew that this prince would become king one day, gave him the best of education, trained him in all skills and provided him with the required resources to enlist soldiers too. After that he sent him away along with the soldiers he recruited. When he was old enough to become king, Pandukabhaya fought his uncles to claim his right to the Throne. Eight of his ten uncles perished. Abhaya, who had never fought against Pandukabhaya, was not killed. Pandukabhaya was a good king and reigned over Sri Lanka for 70 years, leaving the country in a prosperous state when he died.